Aim: to evaluate the diagnostic yield of brush cytology for biliary strictures detected on ERCP when a systematic approach is used. Patients and methods: data on 62 consecutive patients with a biliary stricture on ERCP were collected. Cytological samples were processed immediately after brushing in the endoscopy room, and all were analyzed by the same pathologist. For the statistical analysis specimens were classified as positive, negative, suspicious for malignancy (presence of atypias), and unsatisfactory for evaluation. Final diagnosis was based on either histopathologic (surgery or biopsies by other techniques) or clinical/radiographic diagnosis. Results: a total of 71 cytological specimens were included. Definite diagnosis was malignancy in 49 samples, and benign stricture in 22. Three samples were excluded because of insufficient material or processing artifacts. The sensitivity of biliary brushing was 62% (95% CI 0.47-0.77), specificity was 100%, positive predictive value was 100%, and negative predictive value was 58% (95% CI 0.43-0.75). When suspicious samples were included as malignant, sensitivity was 67% (95% CI 0.54-0.81) without changes in the remaining parameters. Eight patients underwent more than one ERCP. Repeated brush cytology exams in these patients yielded a definitive diagnosis in every case. Conclusions: brush cytology has intermediate sensitivity with a high specificity. A systematic approach with a dedicated pathologist and the inclusion of significant atypias as malignant results improves sensitivity. Due to its simplicity brush cytology should be performed in all cases of biliary strictures detected on ERCP, and in case of repeated ERCPs additional cytology brushings are recommended. Key words: Stenosis. Stricture. Endoscopic retrograde cholangio-pancreatography (ERCP). Brush cytology. Objetivo: evaluar la rentabilidad de la citología por cepillado de las estenosis biliares diagnosticadas por CPRE cuando se aplica una metodología sistemática. Pacientes y métodos: se recogieron muestras de 62 pacientes consecutivos con estenosis biliares diagnosticadas mediante CPRE. Las muestras citológicas eran procesadas en la sala de endoscopias inmediatamente a su obtención y analizadas por el mismo patólogo. Para el análisis estadístico se clasificaron los casos como positivos o negativos para malignidad, sospechosos (presencia de atipias) y no válidos. Los patrones de referencia fueron el estudio de las piezas quirúrgicas, biopsias por otros métodos, o la evolución clínica y/o radiológica compatible. Resultados: fueron incluidas un total de 71 citologías. El diagnóstico fue malignidad en 49 casos, benignidad en 22 casos, y 3 muestras fueron excluidas por material insuficiente o artefactos de procesamiento. La sensibilidad de la técnica fue del 62% (IC 95% 0,47-0,77), la especificidad del 100%, el valor predictivo positivo del 100% y el valor predictivo negativo del 58% (IC 95% 0,43-0,75). Al incluir las citologías sospechosas como malignas la sensibilidad fue del 67% (IC 95% 0,54-0,81) sin modificarse el resto de parámetros. En ocho pacientes fueron necesarias nuevas CPRE durante las cuales se repitieron las tomas citológicas, llegando a un diagnóstico de certeza en todos ellos. Conclusiones: la citología biliar presenta una sensibilidad intermedia con elevada especificidad. Una metodología sistemática con un patólogo dedicado y la inclusión de las citologías con atipias celulares como malignas mejora la sensibilidad de la técnica. Dada su sencillez creemos que debe de realizarse en todos los casos de estenosis biliar observada durante una CPRE, incluyendo la repetición de las tomas citológicas siempre que sea necesario practicar más de una CPRE en el mismo paciente. Palabras clave: Estenosis. Citología. Colangiopancreatografía retrógrada endoscópica (CPRE). Citología por cepillado. Biliary tract stenoses are a common finding in ERCPs performed on patients with obstructive jaundice. Treatment depends on the nature of the stenosis, and therapeutic options in cases of malignancy are aggressive therapies with a high morbidity-mortality, so a pathological diagnosis to confirm malignancy is often required. Moreover, by obtaining a tissue diagnosis at the initial ERCP, further invasive tests may be unnecessary and treatment can be initiated without delay (1-5). Current sampling techniques for obtaining bile duct samples during ERCP include intraductal bile aspiration cytology, endobiliary forceps biopsy, brush cytology, fine-needle aspiration (FNA), cytology, and cytopathologic analysis of retrieved plastic biliary stents (1). Brush cytology is the most frequently used tissue sampling technique due to its simplicity, safety and wide availability. A modest overall mean sensitivity of 42% represents its main limitation although sensitivity varies in published studies (2,3). The aim of this study was to assess the yield of brush cytology in patients with biliary strictures detected at ERCP when a systematic approach is used and when a dedicated pathologist performs the cytological analysis. A descriptive, crossed, observational study was designed to study the validity of diagnostic brush cytology during ERCP in biliary stenosis. Patients found to have a biliary stricture at ERCP who underwent biliary brushing cytology were included. We reviewed all ERCPs performed from January 2000 to December 2007. The procedure to obtain cytological samples was similar in all cases. After biliary cannulation with a guide wire was achieved, a contrast diluted to 50% with physiological saline solution was injected to determine the level and length of the stenosis. Next a biliary sphincterotomy was performed, and then the brush and the catheter were inserted into the bile duct. The brush was advanced from the catheter to a point proximal to the stricture, withdrawn slightly, and moved back and forth across the stricture several times. The brush was then withdrawn into the catheter, and both were withdrawn from the endoscope as a unit. The cytology specimen was immediately transferred to a glass slide by the nursuring staff, by smearing the cellular material directly from the brush. The slides were then immersed in fixative (alcohol). 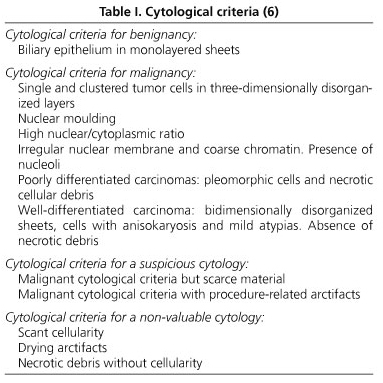 Subsequently, a dedicated pathologist conducted the cytological analysis and classified the samples into four categories: 1) positive for malignancy, 2) negative for malignancy, 3) suspicious of malignancy, and 4) invalid, according to the criteria described in table I (6). To be included in the study patients were required to have a definite final benign or malignant diagnosis. The gold standards used were: the study of the surgical piece or an intraoperative biopsy, biopsies obtained by other methods (endoscopic biopsy or percutaneous puncture of the primary tumor or metastasis), and in those cases without histological confirmation, a clinical and/or radiological compatible follow-up was accepted as evidence of malignancy. Long-term survival was considered evidence of a benign condition, and at least a 3 year follow-up to confirm a negative cytology result was required. Clinical deterioration or death constituted clinical evidence of suspected malignancy. Sample size was estimated on the basis of a precision of 10%, a worst validity index of above 30%, a 90% confidence level, and losses of 5%. As a result 62 patients were estimated to be needed. A descriptive study of the sample was made. Qualitative variables were described in terms of frequency distribution. Quantitative variables were described by reference to their mean and standard deviations. 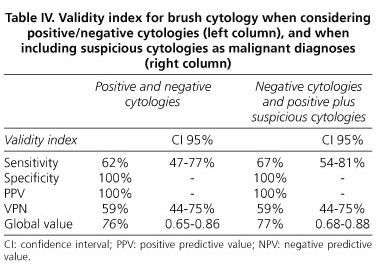 Validity indexes for brush cytology (sensitivity, specificity, positive and negative predictive values, and global value) have been estimated. Seventy-one cytological samples of biliary stenosis from 61 consecutive patients were included for 28 women (45.9%) and 33 men (54.1%). Average age was 71 ± 13.7 years (range: 27-98). In 46 cases (64.8%), cytology was performed of the lower third of the common bile duct, in 13 of the mid-common bile duct (18.2%), and in 12 of the hilium (17%). Average length was 16.5 ± 11.4 mm. A final malignant diagnosis was made in 49 cases (69%) (31 pancreatic adenocarcinomas, 13 cholangiocarcinomas, 2 ampullary tumors, 2 gallbladder tumors, and 1 retroperitoneal metastasis), and 22 cases were recorded as benign (31%). Cytology results showed 25 samples positive for malignancy (35.2%), 37 negative for malignancy (52.1%), and 6 suspicious of malignancy (8.5%), and 3 samples (4%) were excluded because of insufficient material or processing artifacts. Sensitivity was 62% (95% CI 47-77), specificity was 100%, positive predictive value was 100%, and negative predictive value was 59% (95% CI 44-75). We also analyzed the cancer detection rate of brush cytology, considering those samples classified as "suspicious for malignancy" as equivalent to malignancy, thus obtaining a sensitivity of 67% (95% CI 54 - 81) with the remaining parameters unchanged (Tables II-IV). Eight patients with no final diagnosis underwent more than one ERCP, and in these cases a new cytology brushing was performed; results are shown in table V.
Biliary strictures are a common finding on ERCP for jaundiced patients. Benign strictures are often the result of surgery on the bile duct or secondary to inflammatory processes (7,8). Malignant stenosis can be caused by tumors of the pancreatobiliary area (pancreatic adenocarcinoma, mucinous or serous cystadenoma, cholangiocarcinoma, adenocarcinoma of the ampulla of Vater, hepatocellular carcinoma, gallbladder cancer) or by extrinsic compression due to lymph node infiltration or metastasis (9,10). Curative treatment of malignant stenosis is rarely possible. Palliative treatment options include surgery, chemotherapy, and/or biliary stent placement. Diagnostic confirmation is often required before performing these treatments, particularly chemotherapy treatment (1,4). The ideal sampling technique should have a high sensitivity for the detection of malignancy with absolute specificity. The technique should be simple, safe, fast and relatively inexpensive for widespread use. The current methods for obtaining samples of bile ducts during ERCP are intraductal bile aspiration cytology, endobiliary forceps biopsy, brush cytology, fine needle aspiration (FNA), and analysis of retrieved occluded plastic stents (1). Several studies have evaluated the combination of these techniques for obtaining tissue samples from biliary strictures at ERCP, showing that the combination of at least two of them increases cancer detection rate. The highest sensitivity was found with the combination of intraductal biopsy, cytology brushing, and endoscopy-guided FNA (2,3,11). Newer diagnostic techniques such as intraductal ultrasound (IDUS) and advanced cytology techniques (DIA, FISH) to identify chromosomal abnormalities have been shown to improve sensitivity while maintaining a high specificity, although their usefulness in clinical practice remains to be demonstrated (12). Intraductal bile aspiration is one of the earliest and easiest methods for obtaining cytological material, but sensitivity is very low (6-32%) (1,13), so its use is limited. Intraductal biopsy is a laborious technique that is not free of complications (14,15), so although its sensitivity is higher (43-84%) it is not used in regular clinical practice (2,14-16). Fine needle aspiration (FNA), initially endoscopy-guided (17) and now endosonography-guided (EUS-FNA), demonstrates a high sensitivity in the diagnosis of biliary stenosis due to pancreatic cancer (60-93%) (18-21), and only moderate sensitivity in the case of stenosis of uncertain etiology (50-75%) (22,23). Despite its high sensitivity, it is not available in every center, so it should be considered an additional technique according to its availability. Another method is the analysis of retrieved plastic stents but that is impractical as a first line approach since diagnosis would be delayed until the stent is retrieved (1). Brush cytology is the most frequently used tissue sampling method for obtaining material from stenosis at ERCP, and is the one we perform in our hospital. It was first described by Osnes et al. in 1975 (24). It is simple, technically easy, safe, and available in most centers (1,2,25,26). It is performed by passing a brush with its catheter through the endoscope into the biliary tree to the proximal end of the stricture under fluoroscopy. The brush is advanced from the catheter, withdrawn slightly, and then moved back and forth across the stricture about 10 times. Afterward the brush is withdrawn into the catheter and both are withdrawn from the endoscope to perform a smear. As an alternative the brush can be cut and fixed afterwards in a fixative solution, to be sent immediately to the laboratory (2). Diagnostic specificity in the published literature is above 95%, with 100% reported in most studies. Most published series show no false positive diagnoses, although there are some cases described (2,27). In our study specificity was 100% with no false positive diagnoses. Although it has a high specificity, brush cytology has a variable and modest sensitivity for cancer detection ranging from 18 to 65% (average 42%) (2,3,27-30). Most studies have reported very low sensitivities, such as Lee et al. (26), Ponchon et al. (16), Foutch et al. (13) and Harewood et al. (29) (37, 35, 33 and 18%, respectively), while only few studies report higher sensitivities, like Mahmoudi et al. (27), Stewart et al. (25) and Urban et al. (30), who report sensitivities of 61, 59, and 65%, respectively. This variability in sensitivity could be explained by various factors: experience, skills, different techniques employed, differences in cytological criteria for sample classification, and inclusion of both pancreatic and biliary stenoses in some studies. In our study brush cytology correctly diagnosed 40 of 62 cases with a sensitivity of 62%. Despite this modest sensitivity for a diagnostic test, it is one of the highest reported, considering that this result is obtained only by analyzing positive and negative cytologies, and not considering those suspicious of malignancy. We believe that these results are due to systematic methodology and the experience of a dedicated biliopancreatic pathologist. It has been suggested that the limited sensitivity of brush cytology may be due to inadequate samples, difficulties in sample processing, and variability in interpretation by pathologists (16,31). Problems related to the adequacy of samples are usually due to inappropriate slide preparation, which depends on the degree of training of endoscopy personnel (in the absence of a cytotechnician), and artifacts such as blood or an excessive amount of material (1). In our study, 3 of 71 cytologies were excluded (4%) because of inadequate cellular yield. This result is comparable to those reported in previous studies (25), showing that brush cytology can obtain an adequate sample in most cases. Hilar location of the tumor, or an extrinsic location with compression of the biliary tree, filiform stenosis, ulcerated tumors, with fibrosis or much differentiated areas, and submucosal growth are other limitations for obtaining an adequate cellular sample (1,31,32). A recent study (27) showed that age, mass size (more than 1 cm), and stenosis length (more than 1 cm) were associated with a higher yield. Our series was not sufficiently large to allow conclusions in this regard. There have been unsuccessful attempts at increasing brush cytology sensitivity by means of dilating the stenosis beforehand (2,3). For this reason we did not dilate prior to sampling. However, repeat cytologies have been shown to enhance cancer detection rate (2). Despite the limited number of cases, our experience confirms these results. For every patient in whom a repeat cytology was performed a correct diagnosis was achieved. This suggests that repeat brush cytologies should be performed whenever an ERCP is repeated in patients with uncertain etiology biliary strictures and previous negative cytology. Another factor that influences the sensitivity of the technique is sample interpretation. The experience of a dedicated pathologist is critical in terms of achieving adequate sensitivity. Stewart et al. (25), in a review of 406 patients, showed an increase in sensitivity from 44.3% in earlier samples analyzed to 70.7% in later cases, and this was attributed to the greater experience gained by both the pathologist and the endoscopist. In our institution we have a pathologist specializing on biliopancreatic pathology available, and we believe that this could expertly explain our good results. Likewise, the endoscopy team, endoscopist and nurses, performed the technique using a systematic methodology. From our point of view this is another determining factor to explain results. In a recent study by Urbano et al. (30) the usefulness of the boarding team was confirmed, and this was the explanation they gave for their good results (sensitivity 65%). Consideration of atypias is also an important variable when interpreting cytological samples. The term atypia refers to cellular changes that show some features of malignancy but not enough to classify the specimen as ultimately malignant. Atypias are commonly found at the marginal area of a carcinoma, and in preneoplastic and inflammatory processes (1). Some authors differentiate between high- and low-grade atypia according to morphological characteristics (hyperchromatism, increased nuclear-cytoplasmic ratio), and some studies suggest that accepting high-grade atypia as malignant increases sensitivity for the technique, and maintains excellent specificity (1,33,34). Other authors use a diagnostic classification adding the term "suspicious of malignancy" and keeping the term "indeterminate/atypia" for those cases where suspicion of malignancy was low but could not be ruled out (35). In our study samples were classified into four categories: 1) positive for malignancy, 2) negative for malignancy, 3) suspicious of malignancy, and 4) not valid, according to the criteria described in table I (6). When suspicious cytologies were included as malignant cases, sensitivity increased from 62 (95% CI 47-77) to 67% (95% CI 54-81) without changing specificity, although this increase was not statistically significant. In conclusion, brush cytology of the bile duct in our study showed a sensitivity of 62%, which represents one of the highest sensitivities reported, and we believe this is due to the use of a systematic methodology and the study of samples by an experienced pathologist. The inclusion of suspicious cases as malignant improves sensitivity for cancer detection rates (62 vs. 67%) without modifying specificity. Because of its simplicity we believe that brush cytology should be performed in all cases of biliary stricture detected during ERCP, and that it should be repeated in case another ERCP needs to be performed in the same patient, as this may improve diagnostic yield.